The Collegiate Peaks Wilderness might have the highest average elevation of any wilderness area in the lower 48 states, according to the White River National Forest, which manages much of the area. With eight peaks that are higher than 14,000 feet and 105 miles of trails, this is a peak-bagger's paradise. Fourteeners Mount Yale, Mount Oxford, Mount Columbia, Mount Bedford, Mount Harvard, Huron Peak, La Plata Peak and Misssouri Mountain all reside in the Collegiate Peaks, Colorado, southeast of Aspen in the Sawatch Range. Adventurers can find a concentrated number of easily accessed high mountains to climb in the Collegiate Peaks, but they should not expect to find solitude. The wilderness lies a short distance from Aspen, Crested Butte, Buena Vista, Twin Lakes, Gunnison, and other smaller Rocky Mountain communities, and is within a few hours' drive from Front Range metropolitan areas. But for those able to visit on weekdays and explore the lesser traveled of the 168,000 acres are sure to find a place for themselves among the expansive beauty. Collegiate Peaks Wilderness is located in the White River, San Isabel and Gunnison national forests southeast of Aspen. It surrounds the Continental Divide from the south side of Highway 82 at Independence pass, south to Highway 304 west of Buena Vista. Numerous access points can be found off Highway 82 and Highway 24. All four seasons, with summer and early fall the most popular. La Plata Peak (4.3 miles): From Highway 82, take the turnoff marked "South Fork Lake Creek." Parking is on the south side of Highway 82. FDR 391 crosses private land for 1.6 miles and parking is not allowed anywhere along this stretch. Walk about a third of a mile on the road to the signed beginning of the La Plata Gulch Trail. The trail crosses private land, heading east to a steel truss bridge over the South Fork. Follow the trail across La Plata gulch for two miles to treeline. One route is defined from treeline to the summit by rock cairns or recent trail work that delineates the standard route. Mount Harvard (6.5 miles): From the Buena Vista traffic light at the junction of Highway 24 and the Cottonwood Pass Road, travel north along Highway 24 for 0.4 miles. Turn left (west) onto Chaffee County 350 and follow it for about two miles. At the T-intersection, stay right and head north, then northwest. Turn left (south) onto Chaffee County Road 365 and follow as it turns toward the west for just over five miles to the end of the road and the trailhead. Once you’ve reached the trailhead, follow the trail west for two miles to the fork in the trail. Stay right (north) toward Horn Fork Basin and Bear Lake. The route follows the tundra slopes on Harvard’s south shoulder. Mount Yale (9 miles): From Highway 24 between Leadville and Buena Vista, take Chaffee County 350 (west) for two miles until you hit Chaffee County 361 and head north (right) where it intersects with Chaffee County 365 (North Cottonwood Road). Travel south and then west for five miles to the end of this road and the trailhead. From the trailhead, follow the well-defined trail (west) to the Kroenke Lake/Hornfork Basin junction. The right-hand trail leads to Mount Harvard, Mount Columbia and Bear Lake. There is a designated route only up the south ridge. Follow the treeline at the mouth of the basin, traveling east, and to the south of the prominent rock outcrop. Then continue up the south ridge to the summit. Allowed anywhere but within 100 feet of lakes, streams and forest development trails. Several Developed campgrounds border Highway 82 east of Aspen. 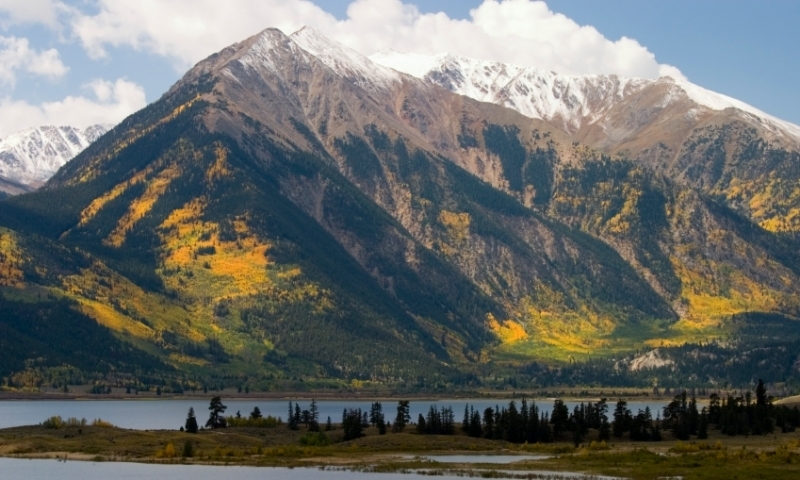 Weather in the Colorado Collegiate Peaks can change quickly. Visitors should be prepared for all conditions – even snowstorms in the summer.